IRVINE, Calif., November 4, 2013 –Kia Motors America (KMA), one of the fastest-growing car companies in the U.S. over the last five years1, today announced the launch of the all-new Kia.com. Designed and built in partnership with Publicis Groupe's Denuo, the completely redesigned site offers a premium experience across tablet, mobile and desktop devices. 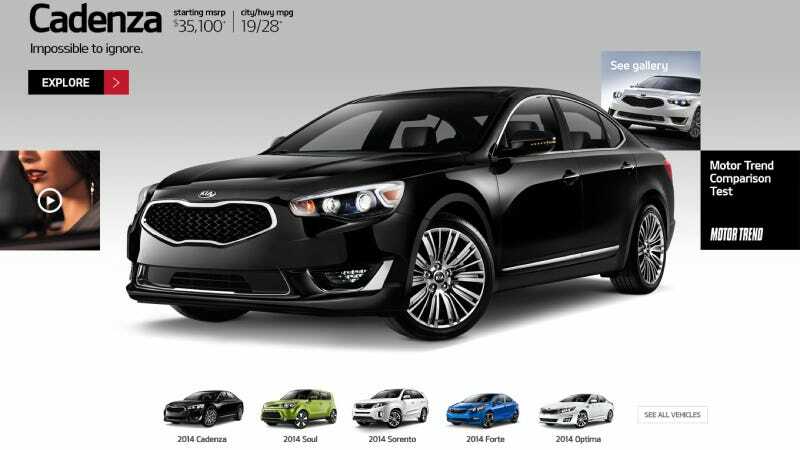 The transformation of Kia.com includes a 135 percent increase in viewing area for desktops, deeper-quality images, the incorporation of video and animations with enhanced storytelling to support the Kia brand and the capability to demonstrate vehicle features. Denuo worked to create a digital destination that integrates social media features while also including responsive design to assist in the research and buying experience. Consumers also can enjoy a user-friendly vehicle inventory module to search for available vehicles. "With a diverse lineup of cars and CUVs that are more stylish, innovative and technologically advanced than ever before, we set out to develop a new way to showcase the Kia brand in the digital domain and establish a technological foundation for Kia.com's future growth," said David Schoonover, national manager of CRM & Digital Marketing, KMA. "Given Kia's advancements in quality and refinement, ensuring our digital properties present our products in a befitting manner is a priority for us, and Denuo successfully leveraged powerful storytelling methods to deepen engagement and loyalty while advancing Kia.com's ability to grow alongside our brand." To experience Kia's new site, please visit www.kia.com. Kia Motors America is one of only three auto brands to increase U.S. sales in each of the past four years, and in 2012 the company surpassed the 500,000 unit mark for the first time. With a full line of fun-to-drive cars and CUVs, Kia is advancing value to new levels of sophistication by combining European-influenced styling – under the guidance of chief design officer Peter Schreyer – with cutting-edge technologies, premium amenities, affordable pricing and one of the lowest costs of ownership in the industry. Kia recently moved up in the exclusive ranking of Interbrand's "Top 100 Best Global Brands" after joining the list for the first time last year, and the company is poised to continue its momentum with seven all-new or significantly redesigned vehicles scheduled to arrive in showrooms in 2013. Over the past decade, Kia Motors has invested more than $1.4 billion in the U.S., including the company's first U.S. assembly plant in West Point, Georgia – Kia Motors Manufacturing Georgia – which is responsible for the creation of more than 14,000 plant and supplier jobs. The success of the U.S.-built* Optima and Sorento in two of the industry's largest segments has fueled Kia's rapid growth and is complemented by Kia's comprehensive lineup which includes the Cadenza flagship sedan, Soul urban passenger vehicle, Sportage compact CUV, Optima Hybrid, the Forte sedan, Forte5, and Forte Koup compacts, Rio and Rio 5-door sub-compacts and the Sedona minivan.